With the November 2012 deadline for the implementation of EU Directive 2010/63 on animal experiments fast approaching, the NAVS and ADI have submitted a number of expert evidence contributions to the Home Office and the European Commission, to secure implementation of policies to replace animal use as well as the best possible protection for laboratory animals. Our comprehensive and detailed scientific submissions have shaped sections of the newly proposed legislation and we continue to work hard to influence the application of the new laws. However, there is still much to do in terms of public education and awareness, as well as development of methods to replace animal use. Click here to donate now, and help us continue to work to end the use of animals in laboratories. Codes of Practice – These cover the specifics of animal care and accommodation. The NAVS stressed the importance of retaining the UK’s stricter measures where these were better than the new Directive. Furthermore, we used scientific evidence to demonstrate how the current, larger UK cage sizes, are still not sufficient to allow normal behaviour in the animals. The importance of many other aspects of care was covered such as handling, enrichment and substrates, with detailed sections for a number of animal species. Conflict of interest – Notes were submitted by NAVS on the Government’s proposals for ensuring that the Named Veterinary Surgeon and the Named Animal Care and Welfare Office do not have a financial or other interest in the establishment in which they work. Cumulative severity – Focusing on the long term use of NHPs in neurological experiments, this invitation for comment was seeking advice on the assessment of suffering caused to an animal over a period of time. We submitted a large list of considerations for the assessment of cumulative severity, covering all aspects of NHP life, from the removal of the individual from its family group, the effects of transport, through to death. We also covered the very latest scientific assessment of suffering and the ethics of the use of NHPs in long term research. Non-human primates (NHPs) – Proposals were provided on Article 8 of the new Directive, which specifies provisions for the use of NHPs. The ADI submission advised on: a further definition of the phrase “debilitating or potentially life-threatening clinical conditions in human beings”, for which the experimental use of NHPs is permitted, including legal advice on this definition; the use of NHPs in basic research; species differences between humans and NHPs and the affect on justification for their use; the use of endangered species and the use of great apes. Retrospective severity – The European Commission requested comments on reviewing the severity of animals involved in procedures carried out for the production of genetically modified animals. The ADI submission detailed the harms which genetically modified animals endure, including those animals which are not themselves modified, but are used in the process to produce modified animals (millions of “unwanted” animals die, as only about 10% of the GM offspring carry the modified gene that is wanted). ADI put the spotlight on the unpredictable nature of genetically modifying animals as well as the huge numbers of surplus animals produced. A section on genotyping also covered the harms caused by the removal of tissue which is used for DNA analysis. 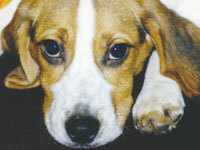 Education and training – Proposals were made on the training of those working with animals in laboratories. These included that such personnel are aware of societal ethics, that they are flexible in their knowledge, allowing them to keep up with advanced in animal’s welfare and the three Rs, and that they are rigorously assessed. Non-technical summaries (NTS) – These summaries are required under article 43 of the EU Directive to promote transparency on the use of animals in research. ADI highlighted the problems with the current “abstracts”, published by the Home Office, which are voluntary and have no set format or requirements. The ADI proposals on information which should be required in the NTS would ensure that members of the public and other interested parties could gain a fuller insight into how animals are used for research purposes. Please support our campaigns to end the suffering of animals in laboratories, and help fund our innovative humane research projects with a donation. Thank you!